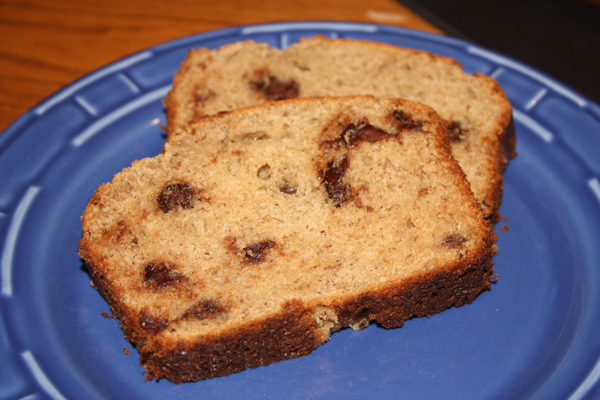 I know I have posted my mom’s banana bread on my blog before today. However, after making the chocolate zucchini bread with sugar in the raw and whole wheat flour, I decided to give it a try in my banana bread recipe. I am happy to say that it was super yummy. When my resident food critics arrived home from school, I had them sample the updated recipe for their after-school snack. I did give them a heads up that I had altered my recipe a tad so they needed to let me know how the new recipe compared. They loved it and William said he even liked it better. Score!!!! I honestly could not really tell a difference (I’m guessing William couldn’t either even though he said he could) so when Jeffrey came home I told him I had “updated” the banana bread, but he had to figure out what was different. Even after eating a whole slice he couldn’t figure out what was different. It reminded me of the time that I painted our living room with the help of my mom and he couldn’t tell what had changed while he was gone on a trip. All of this to say, I think this is a sign that the upgrading to sugar in the raw and whole-wheat flour to make it a little bit better for us was well worth the experiment. 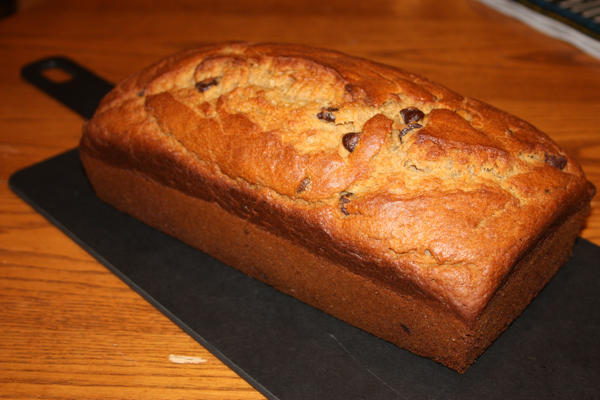 I am always looking at ways to boost our whole grains and make our special treats a little bit healthier and with this banana bread the mission was accomplished. I will be using this revised recipe from now on. Preheat oven to 350 degrees. Grease a large loaf pan (or 3 smaller ones). In a medium sized bowl combine flours, baking soda, cream of tartar, and salt. Gently whisk to combine ingredients together. In a large bowl of a stand mixer or mixing bowl beat butter and sugar until smooth and creamy. (If using sugar in the raw you will still see specks of sugar and that is ok as long as your butter is creamed.) Scraping the bowl down as needed. Add eggs one at a time, beating after each addition. Stir in mashed bananas. Add flour mixture, 1/2 cup at a time, beating well after each addition. Stir in water and vanilla by hand. 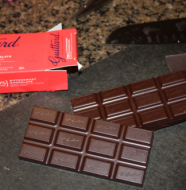 Stir in chocolate chips if using. Pour into prepared pan(s). Bake for 55-60 minutes for a large loaf and around 30 for smaller ones. Test loaves with a toothpick to make sure they are fully cooked. Let cool in pan for about 5 minutes then remove from pan and cool on wire rack. 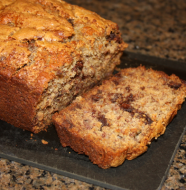 2 Comments on "Updated Banana Bread"
MMMM Banana bread with chocolate chips.MM And of course I’m still drooling over even the mentioingn of that zuchini bread recipe!